Malyn Varen is a Dunmer sorcerer and former trainer at the College of Winterhold. He was pursuing research with soul gems, particularly the Daedric artifact Azura's Star although his research had a secret personal agenda. He was dying from disease and wanted to use Azura's Star to seal his own soul and become immortal. However the rules of the Star were that it would only allow white souls to enter and being a mortal, his soul was black. After continuous experimenting on the Star, Azura cursed him and drove him insane; his behavior became erratic, he would see things that weren't there and shout at students for things they hadn't said. After he killed a student and used her soul for his research, he was expelled from the College. He left with his most loyal students to Ilinalta's Deep where he could continue his research free of the prying eyes of his colleagues in Winterhold. After he left the college he became more and more desperate, even to the point that he was damaging the exterior of the Star. Although he finally succeeded in sealing his soul in the Star, it was badly damaged. It required a constant supply of black souls to hold it together and keep him alive, which his disciples provided for him. The skeleton of Malyn Varen is found inside Ilinalta's Deluge sitting on his throne, with his Malyn Varen's Grimoire beside him and the broken Azura's Star at his feet. 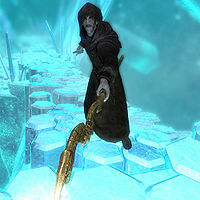 Inside the Star, Malyn wears hooded black mage robes with a pair of boots, and he carries a staff from the school of Destruction as well as a leveled dagger. Malyn knows the Alteration spells Oakflesh and Stoneflesh, the Destruction spells Chain Lightning, Lightning Bolt, and Ice Spike, and the Restoration spells Close Wounds, Fast Healing, and Steadfast Ward. When you enter the Star, he'll approach you and say, "Ah, my disciples have sent me a fresh soul. Good. I was getting... hungry. Wait. There's something different about you." You can tell him his experiment is over or that he can't escape his fate, but either way he'll respond, "And who are you to challenge me? I have conquered mortality itself. I've spat in the eyes of the Daedric Lords. This is my realm now. I've sacrificed too much to let you take it from me!" Alternatively, if you just leave the conversation, he'll say, "This is my realm. I won't let you take it from me!" When you kill him, his last words will be: "No. Not like this." Ironically, if you kill a Dremora and he gets to the body, he may comment, "Murder! By Azura, who would do such a thing?". After killing Malyn you may be attacked by necromancers carrying a scrawled note while out in the wilderness. As a Dunmer, he will say "Azura curse you!" during the fight, even if you are the champion Azura sent after him. This page was last modified on 22 November 2018, at 05:00.